It has been thirteen years since the majority of Central and Eastern Europe’s centrally planned economies began a transition to a capitalist system. In that time, several alternative paths to a market economy have been pursued in different countries, with varying degrees of success. As a result, there is no one commonly agreed approach to transition. Many policymakers and academics favor a rapid adjustment, or “shock therapy” approach; others support gradual implementation. The experiences of a wide range of countries suggest that rapid implementation produces more economically efficient outcomes with fewer long-term costs in terms of growth, inflation and standards of living. Yet the choice of shock therapy while designing policies was not a guarantee of these results; rather, it was whether policies were rapidly implemented that determined outcomes. Poland and Romania provide a lesson in the factors that determine the pace of policy implementation because both started off with relatively similar assets and disadvantages, and intended to implement the same policies, but diverged in actual implementation. Poland pursued a strategy of rapid implementation; Romania instituted gradualism. That this difference in implementation led to divergent growth outcomes is clear. Rapid policy implementation leads to more rapid growth; gradual implementation delays and can sometimes impede growth. What will emerge from this analysis is that political constraints determine the pace of policy implementation. The Polish and Romanian experiences are relevant for a Cuba in transition because they may provide guidance to a transition government on how political constraints can be incorporated into a strategy of rapid policy implementation. This paper will limit itself to a discussion of the first five years after transition. The focus will consequently be placed on stabilization rather than structural reform, since the latter can be seen as a medium- to long-term challenge for transition economies. In addition, stabilization is a prerequisite for sustainable growth (Gomulka 2000), and its optimal implementation is crucial for the success of later reforms. Outcomes will be largely measured by growth of GDP, inflation rates, and several economic indicators that signify general standards of living. This analysis confines itself to countries with similar initial conditions, because they may influence the timing and design of reforms as well as the speed of implementation. Positive initial conditions, such as the existence of a private sector or educated labor force, contribute to economic growth, while negative ones, such as over-industrialization, negatively affect growth (Balcerowicz 1997). While well-designed and strongly-implemented policies help to diminish the effects of negative initial conditions, countries that begin transition from a deeper level of economic crisis will have more difficulties in overcoming reform inertia (de Melo, et al. 2001). Because Poland and Romania shared similar advantages and disadvantages at the outset of transition, any effect these advantages and disadvantages may have had on growth outcomes or policy implementation would be fairly equal for both countries. Cuba’s current conditions should align with those of Poland and Romania just before their transitions to draw relevant lessons for a Cuban transition. Differences in initial conditions were not significant enough to account for the divergence in policy delivery or outcomes in Poland and Romania. De Melo, et al. (2001) note that most of the variability in outcomes that could be attributed to initial conditions are explained by two clusters of factors. The first is defined by pre-transition GNP levels, level of industrialization, and share of industry in GDP. The second consists of factors such as market memory, trade dependence, and repressed inflation. Table 1 compares several of these indicators for pre-transition Poland and Romania. Pre-transition GDP per capita levels were only hundreds of dollars apart. Levels of industrialization—as determined by the share of industry in GDP—were similar. What these statistics indicate, first, is that both countries had relatively similar levels of development: they both started off with relatively similar living standards at the beginning of transition and differences in development levels were not significant enough to affect transition outcomes. (Secondary school enrollment is included in this cluster, as an educated labor force is a sign of a high level of development as well.) Second, the two countries were not over-industrialized, which Balcerowicz (1997) points to as an initial condition that negatively affects transition. Years under communism is an important indicator because it illustrates the level of market memory, or the amount of time since market infrastructures were last in place. The number of years under central planning can be seen as a proxy for the degree of change required, as the fewer the number of years, the smaller the degree of large-scale institutional change that will need to take place (de Melo, et al. 2001). Finally, exports and imports indicate the level of openness of an economy, and its competitiveness.1 The levels of this variable mean a rather negative initial condition for both Poland and Romania, but because the levels were similar, the two countries were on equal footing at the start of transition. Initial conditions thus do not determine the divergence in transition outcomes. Cuba possesses initial conditions similar to those in Poland and Romania just before their transitions, so a reasonable comparison among the countries is feasible. The Polish and Romanian data, from 1989, is matched with Cuban data from 20002 under the assumption that if a Cuban transition were to happen tomorrow, this is what the economic situation would look like. Based on this assumption, the Cuban data illustrates conditions just before a system-wide political and economic collapse. 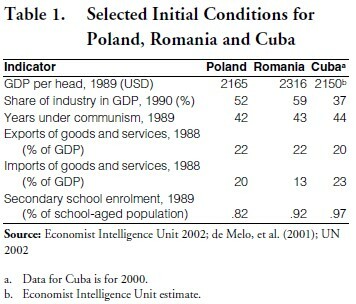 Cuba’s GDP and secondary school enrolment parallels Poland’s and Romania’s, indicating the general level of development. Share of industry in GDP is slightly lower, which may be to Cuba’s advantage as it will not suffer from the negative effects of over-industrialization. Market memory still exists, as Cuba would have spent a similar number of years under communism as Poland and Romania. In addition, the level of openness of the economy is similar as measured by imports and exports. These similarities can be taken as an indication that Cuba may suffer many of the same post-transition problems as Poland and Romania and need to design and implement stabilization policies accordingly. If anything, Cuba is better poised for a transition, as it already suffered and adjusted to the drop in output that followed the collapse of the Council for Mutual Economic Assistance (CMEA). It must still tackle the post-transition question of creating an atmosphere conducive to rising living standards and general growth in the face of potential political constraints, however, and lessons drawn from Poland and Romania’s transition could prove helpful. Design and sequencing of transition policies continue to be hotly debated, but the place of stabilization within the context of a reform sequence has become less of a contentious issue because of the results that have emerged from more than a decade of reform in Eastern Europe. Generally, stabilization is necessary for growth because it reduces inflation, and growth cannot be sustained at a level of inflation above 40 percent (Fischer, Sahay and Végh 1996; Gomulka 1998). In terms of its place in an overall sequence, stabilization should be instituted quickly, as early stabilizers faced early declines in output, but also experienced growth earlier (Åslund, Boone and Johnson 1996). Often, the year in which a stabilization policy is implemented is also the year when inflation falls and output ceases to decline, and two years after a stabilization policy is implemented, growth becomes positive (Fischer, Sahay and Végh 1996). The concept of what constitutes “good” stabilization policies, or those that serve to limit inflation and create an environment conducive to growth, is trickier. Lavigne (1999) provides a detailed description of what a typical stabilization policy should (and in some countries, did) consist: price liberalization, balancing the budget by increasing taxes, a restrictive monetary policy, at times an incomes policy, and foreign trade liberalization. Such stabilization packages were anchored through an exchange rate regime, and were complemented by two key structural changes: banking and financial sectors reforms, and privatization, either through restructuring of state-owned enterprises, or by dismantling barriers of entry and exit to foster the growth of a de novo private sector. This description overlooks the significance of institutions and their role in “grounding” such policies as some authors, notably Stiglitz,3 have pointed out. Stiglitz argues that the architects of the transition in certain countries underestimated the significance of the institutional and legal infrastructure required to create an effective market economy. This lack of infrastructure meant that certain policies, however well crafted, could not be enforced. This is a very compelling argument, and one that warrants further research, particularly on the intersection of institutions and effective policy implementation. For the purposes of this discussion, the focus remains on policies alone. It is worth noting, however, that while there were likely some key differences between Poland and Romania’s institutions at the outset of transition, both countries had similar institutional capacity compared with newly independent countries like those in Central Asia. Neither Poland nor Romania had to establish state-level institutions—like a central bank—from scratch, and it is unlikely Cuba would need to do so. This analysis confines itself to countries that aimed to implement similarly designed policies in a similar sequence so that divergent policy design can be eliminated as a possible cause of different policy implementation. On the surface, it may appear that Poland and Romania had different aims and pursued different policies. Romanian President Iliescu said early on that, while he intended to move Romania to a market economy, his version would be “market socialism” (Poirot 1996). However, the aims of Romania’s reforms never wavered, and the fact that Romania intended to implement policies similar to Poland’s is made clear by a May 1990 publication of the provisional government of Romania, entitled “Outline of Strategy for Transition to a Market Economy in Romania.” The objective of the economic reforms, the report states, is a transition to a market economy, a change for which there is a national consensus. The report goes on to say that “various measures cannot be delayed because they aim at medium- or long-term purposes, for delaying them would render the tasks of the future government much more difficult, and … any delay would increase the social costs of transition immeasurably” (Demekas and Khan 1991). The 1990 policies held the same aim but suffered from a lack of coherence. In 1991, however, Romania re-implemented stabilization in conjunction with an IMF agreement, and these policies were similar to Poland’s. In Poland’s 1990 and Romania’s 1991 stabilization reforms, the aims included liberalization of trade, price and capital flows. Both desired financial sector reform, beginning with the breaking of the monobank system and the establishment of an independent central bank. Careful fiscal and monetary policies were meant to be pursued to ensure price stability and balance of payments equilibrium. A drive to curb the high inflation that resulted from price liberalization in conjunction with the monetary overhang was part of this. In addition, Romania placed special emphasis on social measures to ensure that living standards would be protected and start to improve. However, its planned measures included reforms that affected the entire population, not special interest groups, such as improved social insurance and a minimum wage law. Poland also aimed to circumvent privileges for special groups, and part of the theory behind its shock therapy approach was that while immediate reforms may hurt the population, they would do so evenly, ensuring that a rise in living standards would benefit the majority. The design of Poland’s 1990 and Romania’s 1991 stabilization policies were similar, and is thus not a sufficient explanation for the divergence of growth outcomes. Poland and Romania began their transition processes with similar initial conditions and similar policy aims in mind. Yet Poland proceeded in implementing its reforms in a rapid fashion, while Romania delayed implementation. This may appear as a deliberate choice on Romania’s part, as many still contend that gradualism is a viable option in the presence of political constraints. 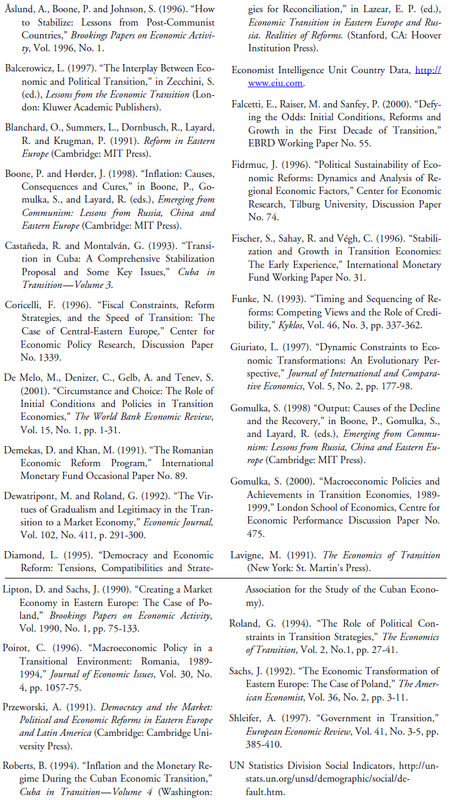 For example, Coricelli (1996) notes that there is often a need for initial transfers to economic “losers” to create support for and foster reforms, and such transfers should be incorporated into policy design. Indeed, gradualists were not opposed to stabilization per se, nor were gradualists necessarily interested in keeping reforms open to reversal. Indeed, most gradualist strategies often resulted from a lack of political consensus over what to do, a desire to soften initial shocks, and fears that initial reforms that create a backlash would make future reforms politically unsustainable (Lavigne 1999). Yet it is the potential presence of this backlash that makes the choice of rapid reform compelling. If certain reforms are implemented piecemeal, opponents have the time to mobilize and become a more formidable force of opposition. Rapid reform that utilizes the economic crisis as a window of opportunity does not meet with a “groundswell of political opposition” threatening to reverse reforms (Åslund, Boone and Johnson 1996). Windows of opportunity, in which potentially unpopular reforms can be rapidly implemented with little opposition, do exist in transition because the deeper the crisis, the more willing the public is to accept deeper reforms. Many of the initial costs of stabilization are temporary and spread over much of the population; institutional reforms such as privatization are usually those reforms that attract the most vocal rent-seeking minorities (Diamond 1995). Why then, would Romania choose to implement stabilization policies gradually? The answer lies in the nature of political constraints in transition. Political constraints fall into two broad categories: ex-ante and ex-post (Roland 1994). Ex-ante political constraints are present at the outset of transition as feasibility constraints that block decision-making or proposals. They can be either internal, as in an inability of government leaders to achieve consensus on policy design or speed of implementation, or external, such as rent-seeking groups. An example of the latter would be a coalition favoring redistribution to workers blocking a policy that redistributed to the population at large. Ex-post political constraints refer to the danger of a backlash and reversal after decisions have been made and outcomes observed, and can also be internal, such as anti-reform government leaders who come to power, or external rent-seeking groups.4 In essence, ex-ante political constraints anticipate the negative effects of reform and apply pressure accordingly, while ex-post political constraints observe negative effects and apply pressure therein. Political constraints exert pressure on governments to design and implement stabilization policies based on political considerations instead of efficiency considerations. Ex-ante political constraints can affect policy design if the government cannot achieve consensus. Policy implementation can also be affected ex-ante by rent-seeking groups anticipating their losses from reforms, especially if reform implementation is delayed. If policies are drawn up slowly, it allows more time for rent seekers to organize opposition to anticipated reforms. Both ex-ante and ex-post political constraints present danger for policy implementation, as governments that have only partially or gradually implemented can face a backlash and be forced to abandon sound policies due to political pressure. If a group is vocal and a government bows to its pressure, policy design can be revised if a policy has not been fully implemented. Ex-post, policy implementation can be hampered if reforms have been only partially implemented. A good example comes from Russia. In Moscow in 1990, partial price liberalization triggered purchases of goods in anticipation of price increases, which led to shortages, foot riots and political pressure on the government to delay further increases (Blanchard, et al. 1991). Political constraints thus have serious potential to undermine reforms. In Poland, a strong political consensus on the part of the first post-communist government led to a clear transition strategy and rapid decision-making process. As illustrated in Table 2, the strategy was to introduce stabilization measures as quickly as possible in a single package: crucial decisions on foreign trade, prices, subsidies, wage controls, taxes, and subsidies occurred in the space of a few weeks at the end of 1989 and beginning of 1990 (Sachs, 1992). The aim of the stabilization reforms was to reduce aggregate demand and anchor the price level through five measures: cutting subsidies and investment spending to restore budget balance; sharply increasing interest rates to control the growth of domestic credit in the banking system; devaluing and making convertible the exchange rate so it could be stabilized at the new rate; limiting nominal wage growth through a tax based policy; and full price liberalization save certain public utility sectors. This rapid and comprehensive orthodox reform package resulted in swift consequences, both positive and negative. As illustrated in Table 3, inflation rose sharply and was in the triple digits in 1990 due to price liberalization, but much of that was in fact concentrated in the first few months of 1990 (Lipton and Sachs 1990). By the end of 1990, monthly inflation had dropped to double digits, and it continued its steady decline through 1995, reaching below the 40 percent level highly conducive to growth by 1993. GDP began growing again in 1992, and average real wages saw growth in 1994. As a result, living standards began to increase in Poland by 1991, after an initial drop at the start of reforms. Average real wages in Poland declined until 1992, and were positive in 1994. Labor costs per hour began to climb in 1991, and continued to grow, becoming double its 1990 level in 1995. GDP per head declined initially, but rose in 1991, and surpassed 1989 levels in 1993. In addition, private consumption rose starting in 1991. While the initial price increase and the decline in living standards were sharper than in countries implementing reforms gradually, the recovery time in Poland was shorter, so that prices stabilized and living standards rose much faster than in gradual reformers. In Poland, the rapid formation of a non-communist government, combined with the quick consensus achieved by the Balcerowicz team, allowed for immediate policy implementation. This meant that little or no social breakdown—which could have influenced policy design or implementation—had the chance to occur before implementation. Because the methods and design were fairly obvious to the population, an overwhelming proportion of people supported the government in this, despite the economic hardship that ensued (Przeworski 1991). In creating coherent policies and implementing them quickly, Poland negated the appearance of ex-ante political constraints. Because there was consensus among those creating the reforms, no internal5 political constraints on the decision-making process existed. Externally, coalitions that might have tried to block reforms were marginal, and did not have time to become more powerful because reforms were implemented so quickly. One reason why ex-ante political constraints may have been minimal in Poland was the legitimacy of the Polish government. The collapse of the communist system was legitimated when a non-communist government took over in Poland, and this government utilized its window of opportunity to initiate reforms not easily reversed should hostile political conditions prevail later (Gomulka 2000). Most Poles favored the move to a different system in the immediate aftermath of transition, and the legitimacy of the Polish government played a role in this support. Funke (1993) notes that the credibility of a government, even a new one, plays a significant role in the amount of ex-ante opposition. If voters know the government is benevolent, its reform objectives will not be met with large opposition. If this is unknown, however, the credibility of the reform program becomes more important. If reform credibility is high, more difficult tasks, such as stabilization reforms that incur immediate, short-run costs, should be completed first. The Polish government utilized this legitimacy and implemented reforms when favor for them was high, before any costs could be fully anticipated or observed. By the time the costs were observed, reforms were imbedded to the point where anti-reform politicians, even if they came to power on the issue of reversing reforms, would find it difficult to do so. Romania, in contrast, implemented its reforms piecemeal; it did not begin with the same sort of consensus that Poland did. First, its political transition occurred at the end of 1989, whereas Poland already had a non-communist government in power in 1989. In addition, there was more social disorganization at the beginning of Romania’s transition, exemplified by a breakdown in law and order, which did not afford the provisional government the luxury of a prereform period in which a broad consensus on strategy could be reached before reforms were implemented (Demekas and Khan 1991). As a result, many reforms had to be modified or replaced later. In addition, although their stated purpose was to move toward a market economy, much of the 1990 reforms were geared more toward crisis management and appeasing vocal demands from the population. In particular, expansionary fiscal and monetary policies were pursued; revenues declined while expenditures on subsidies, pensions and transfers increased; and food exports were banned to improve the domestic availability of food. The authorities pursued these policies because they considered them necessary to ensure social peace vis-à-vis improving living standards (Demekas and Khan 1991). All of these measures contributed to a deteriorating macroeconomic situation in 1990, one that led to a reconsideration of reform priorities and an emphasis on macroeconomic stabilization in conjunction with an IMF stand-by arrangement that became operative in April 1991. In 1991, Romania began to implement a package of reforms that was similar to Poland’s. The new reform strategy consisted of price and trade liberalization, tax reforms and an incomes policy similar to Poland’s. Yet price liberalization was implemented gradually, in three stages (November 1990, April and July 1991), and other measures went slowly as well, such as subsidy reductions. As a result, the Romanian economy performed more poorly than Poland’s in terms of growth. Romania did not experience positive growth until 1993. Its inflation rate did not peak at as high a level as Poland’s, but it stayed in the triple- digit range for three years. More importantly, it did not achieve the threshold below-40 percent inflation rate so crucial for growth as quickly as Poland. In 1994 inflation finally fell to double digits, but it was well above the 40-percent mark, while Poland’s was below that mark in 1994. Finally, living standards were roughly half those of Poland. In Romania, average real wages declined until 1993, and did not become positive until 1995. Labor costs per hour declined until 1992, but by 1995 were still less than its 1990 level. GDP per head declined until 1992, when it began steadily rising. However, by 1995 GDP per head in Romania was much lower than its 1989 level and half the level of Poland’s in 1995. Private consumption in Romania declined until 1993, and in 1995 was also half that of Poland. Ironically, the Romanian program emphasized its desire to maintain living standards as the reason it chose gradual implementation over shock therapy. Romania did not have political consensus on how reforms should be pursued, and had little time to draw up a coherent set of reforms before social unrest became a factor influencing the reforms. Iliescu, a former party member, came to power in December 1989 in a coup that overthrew the Ceausescu government. Immediately, the Iliescu government lacked the legitimacy of the Polish government because of Iliescu’s ties to the old regime. This narrowed the potential for a window of opportunity, although this still could have been utilized had there been a very strong consensus on the part of politicians and policymakers. However, such consensus did not exist. As economic policy was being discussed, a breakdown of law and order was occurring, and the anticipation of the negative consequences of reform was becoming palpable as output declined. Social unrest increased due to this, and ex-ante political constraints emerged. In February 1990, for example, a large group of coal miners converged in Bucharest to demand that the government protect their standard of living (Poirot 1996). Iliescu gave into their demands with large pay increases, at a time when fiscal policy should have been tightened. The failure to resist such demands, and the willingness of the government to incorporate ex-ante political costs into its reform policies, led to poor policy being haphazardly drawn up and implemented throughout 1990. Internally, decision-making was blocked by a lack of consensus, and externally, political groups had the time to gather momentum because reforms were not implemented strongly and immediately. In 1991, when a solid, coherent reform package was designed and began to be implemented, the effects of incorporating ex-ante political constraints became apparent. The Romanian population would likely not tolerate harsh reforms; the window of opportunity had passed. Romania was forced to implement many reforms gradually. A key example is price liberalization. Instead of liberalizing the majority of its prices immediately, Romania did so in three stages from November 1990 to July 1991. Gradual price liberalization can be very dangerous, as noted previously with the Russian example. In addition, gradual price liberalization prolongs the period of high inflation, imposing long-term costs on the population. Yet the greater long-term costs were borne for short-term political acceptance. Such acceptance is unstable however; gradual implementation can lead to a backlash that forces governments to abandon sound policies. Such a backlash would be an example of ex-post political constraints. By incorporating ex-ante political constraints into its early reforms, Romania was forced to implement further reforms gradually, making it more vulnerable to ex-post political constraints. These vastly different experiences point to the degree of significance political constraints have for transition paths. Gradual implementation of stabilization policies is not a feasible option in the presence of political constraints as it can lead to policy redesign based on political considerations instead of efficiency considerations. This in turn can lead to less-than-optimal outcomes in terms of slower, lower growth and delayed increases in living standards. Poland utilized its window of opportunity to bypass ex-ante political constraints, and embedded its reforms so that any potential anti-reform governments that came to power would have difficulty undoing key reforms. Romania implemented its reforms gradually, allowing exante political constraints to anticipate negative effects of reforms and build momentum in opposition. Thus the government had trouble continuing to implement the rest of its reforms as the negative effects were observed. A vicious cycle in which ex-ante opposition gathered momentum and fed into ex-post opposition was created. The key question, then, is how can a post-transition, pro-reform Cuban government implement and make irreversible such reforms in the face of political pressure? Cuba should follow the path of Poland to negate such a cycle from occurring in its post-transition environment. Rapid implementation of stabilization policies can be achieved in several ways despite the threat of political constraints. First, a government can draw on the evidence showing the benefits of rapid implementation to quell any ex-ante rent-seekers’ protestations by utilizing its window of opportunity. Second, governments can create the basis for a liberalized de novo private sector, thus providing alternatives for those potentially made redundant by stabilization measures. To negate the effects of ex-post rent seekers, governments can embed reforms with macroeconomic “poison pills” (Boone and Hørder 1998) to constrain future governments and make reforms more palatable by obtaining conditional assistance from external actors. If there is an internal consensus on which stabilization policies will create a pro-growth environment, those policies are best implemented while a window of opportunity exists. Cuba will have the benefit of ten-plus years of transition in Eastern Europe to draw on; this may negate the possibility of a lack of consensus. That is, if those policymakers in charge of a Cuban transition are well informed about “best practices” such as the Polish path of stabilization, there may be little need for discussion over what the policy should be. The specifics of the macroeconomic situation in Cuba, as well as some differing initial conditions, will mean that policies will not be an exact replica. However, it is a reasonable assumption that Cuba might choose policies that look much like Poland’s. If this is so, one ex-ante political cost—a lack of consensus—will be negated. Cuba can negate the other potential ex-ante political costs by utilizing the window of opportunity. The key concern of a government in doing so is that the pain associated with reforms will result in voters ousting the government. Yet there is quite a bit of evidence to the contrary on this. Balcerowicz (1997) notes that the normal predisposition of voters is to judge a government by a change in their life situation, but in times of special conditions voters are aware that negative conditions are unavoidable and due to external forces, and may respond accordingly. Hence he states that the window of opportunity represents a “period of extraordinary politics.” To take price liberalization as an example, early and decisive price liberalization signals to the public that a new government is intent on making a fundamental break with the past (Roberts 1994). This in turn lends credibility to other reform and stabilization efforts. Typically, ex-ante groups are labor groups anticipating a negative change in their lifestyle due to reforms. Indeed, Fidrmuc (1996) notes that voters in regions hit hard by unemployment are more inclined to vote for parties opposing reforms. The policy implication is that economic reforms should be designed in such a way that they avoid excessive unemployment. Unemployment will be a likely effect of reforms in Cuba, but a government can combat ex-ante groups by implementing reforms that have an immediate, positive short-term effect, such as liberalizing legislation on small- and medium-sized private enterprises. In Cuba, for example, a potentially large service sector of paladares (home restaurants) and casas particulares (private lodgings) are continually repressed by the current government (Castañeda and Montalván 1993). Legalizing such enterprises would create a base of support for reforms, and the potential for workers displaced from industry and agriculture to find new employment in the service sector. If ex-ante costs are negated, many ex-post costs will not arise. However, those that do should not be able to undermine key reforms. There are several measures a democratic Cuban government can take to embed its reforms and create irreversibility. First, immediate stabilization and a government committed to it will itself be politically self-sustaining. As Åslund, Boone and Johnson (1996) note, when stabilization is launched, the industrial lobby “cries out.” Yet its resistance is dependent upon the response and credibility of the government, and eventually managers will begin adjusting when they realize subsidies will no longer be coming their way. The industrial lobby will break up, eliminating one ex-post political constraint to reform. Another measure is what Boone and Hørder (1998) call a “macroeconomic poison pill.” Poison pills are essentially reforms embedded with some measure that changes the incentives of reform reversal for future governments. An example is Estonia’s currency board, which has stringent rules about foreign currency sales and a pegged exchange rate; any change in the rate requires the approval of parliament, which would likely result in a run on foreign reserves. This changes the incentives structure for reversing reforms because the penalty of policy reversal is greater than the net gain. This can only work in certain cases, but it is worth considering in the face of strong ex-post political constraints. A final measure that both Diamond (1995) and Boone and Hørder (1998) mention is conditional assistance. Usually this comes in the form of aid or technical assistance, the key example being the IMF. What role the United States may play in a Cuban transition is unclear; certainly some assistance will likely come from either the U.S. government or the many Cuban exile groups waiting for an end to the Castro regime. An IMF loan, in contrast, would be based more Cuba’s fiscal and economic policies and performance than on domestic U.S. politics. Although problems with some aspects of IMF lending have recently emerged, it does, for better or worse, provide compelling incentives for countries that need its help. If a government does not demonstrate commitment in pursuing reformist policies, the IMF will suspend its loans. While this has not guaranteed nonreversal in the past—in Romania, there was policy reversal after 1995 despite its IMF loan—it does act as an incentive, and a government that is contemplating undermining reforms because of political pressure will need to consider conditional assistance in its cost-benefit analysis. Stabilization is a prerequisite for growth. As part of an overall package of reforms designed to move economies from central planning to the market, stabilization policies should be instituted early to create a growth-conducive environment. While many policymakers favor gradual implementation of stabilization policies, the evidence of a decade of transition suggests that rapid implementation leads to faster recovery of growth and a greater rise in living standards. Yet gradual implementation is often pursued due to political constraints. Achieving rapid implementation in the face of political constraints is difficult, but not impossible. Poland was able to implement its stabilization polices rapidly, with little internal government opposition or opposition from the population, for several reasons. It quickly drew up a stabilization policy, in a few weeks, with consensus on the part of policymakers; it employed the window of opportunity created by the severe economic crisis to push through potentially unpopular reforms; and it utilized its legitimacy as an ex-communist government to make the reforms credibility and thus difficult for future governments to reverse. In contrast, Romania initially suffered from a lack of consensus on the part of policymakers in creating stabilization policies, which led to delayed implementation and the appearance of rent-seekers applying pressure on the government to modify its policy design. By failing to quickly design a stabilization policy, Romania lost the window of opportunity in which to apply it. This in turn made it difficult for Romania to rapidly implement future policies. The lessons for a transition in Cuba are twofold: any Cuban government instituting stabilization policies must incorporate ex-ante and ex-post political constraints into its policy implementation. First, ex-ante political constraints can be circumvented by utilizing the window of opportunity present at the outset of transition. Second, ex-post political constraints can be avoided by embedding reforms; in this way, the net political costs of undoing reforms is too great for it to be considered a viable option. Additionally, by developing the basis for a de novo private sector that could absorb unemployed persons, governments can minimize the pool of rent seekers concerned about redundancies that are the result of reforms. By anticipating and responding to these constraints, Cuba may be able to avoid gradual implementation and the negative economic outcomes that follow. 1. These figures do not distinguish between trade with the West and the CMEA trade, but neither Poland nor Romania had the degree of trade with the West that, for example, Hungary did. 2. This is the latest year for which fairly complete data were available. 3. See Stiglitz, Joseph E. (1999), “Whither Reform?” World Bank Annual Conference on Development Economics Keynote Address, http://www.worldbank.org/research/abcde/pdfs/stiglitz.pdf. 4. Political constraints can also come in the form of widespread opposition to reforms from the population as a whole, but this discussion will focus mainly on government and rent-seekers. 5. Internal is defined as constraints existing within the government; external as constraints coming from groups or a mass of individuals in the population.